A tell-tale sign of spring in California is a flush of new leaf growth on citrus trees. 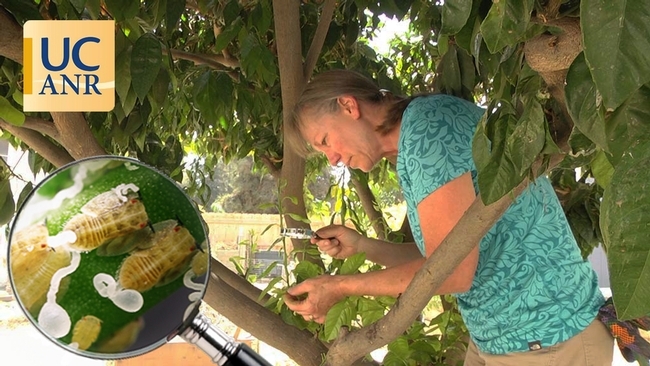 Because the feathery light green leaves are particularly attractive to Asian citrus psyllids (ACP), the leaves' emergence marks a critical time to determine whether the pest has infested trees. Pictures of the Asian citrus psyllids and its life stages are on the UC ANR website at http://ucanr.edu/acp. If you find signs of the insect, call the California Food and Agriculture (CDFA) Exotic Pest Hotline at (800) 491-1899. Asian citrus psyllids are feared because they can spread huanglongbing (HLB) disease, an incurable condition that first causes yellow mottling on the leaves and later sour, misshapen fruit before killing the tree. ACP, native of Pakistan, Afghanistan and other tropical and subtropics regions of Asian, was first detected in California in 2008. Everywhere Asian citrus psyllids have appeared – including Florida and Texas – the pests have found and spread the disease. A few HLB-infected trees have been located in urban Los Angeles County. They were quickly removed by CDFA officials. Grafton-Cardwell has spearheaded the development of the UC ANR ACP website for citrus growers and citrus homeowners that provides help in finding the pest and what to do next. The site has an interactive map tool to locate residences and farms that are in areas where the psyllid has already become established, and areas where they are posing a risk to the citrus industry and must be aggressively treated by county officials. The website outlines biological control efforts that are underway, and directions for insecticidal control, if it is needed. An online calculator on the website allows farmers and homeowners to determine their potential costs for using insecticides. There are additional measures that can be taken to support the fight against ACP and HLB in California. When planting new citrus trees, only purchase the trees from reputable nurseries. Do not accept tree cuttings or budwood from friends or relatives. After pruning or cutting down a citrus tree, dry out the green waste or double bag it to make sure that live psyllids won't ride into another region on the foliage. Control ants in and near citrus trees with bait stations. Scientists have released natural enemies of ACP in Southern California to help keep the pest in check. However, ants will protect ACP from the natural enemies. Ants favor the presence of ACP because the psyllid produces honeydew, a food source for ants. Learn more about the Asian citrus psyllid and huanglongbing disease by reading the detailed pest note on UC ANR's Statewide Integrated Pest Management website. Assist in the control of ACP by supporting CDFA insecticide treatments of your citrus or treating the citrus yourself when psyllids are present. Support the removal of HLB-infected trees. I have a mature Navel Orange tree, and a mature Tangelo tree. The Tangelo tree has what looks like the Asian Citrus psyllid on the new green growth leaves. I would like to have someone from the UC Agricultural Extension have a look at my tree. The mature Navel Orange tree has brown spotted old leaf's.. These are my beautiful old trees that I do not want to loose or to have it spred to other Citrus growers in my neighborhood. My next door neighbor lost both her Mature Navel Orange and her lemon tree last year. We did not have knowledge of this pest until I heard broadcasted on my radio today. Hi Raciel, If you live in California and think you have Asian citrus psyllid on your tangelo tree, please call the California Food and Agriculture (CDFA) Exotic Pest Hotline at (800) 491-1899. Pictures of the Asian citrus psyllids and its life stages are on the UC ANR website at ucanr.edu/acp.